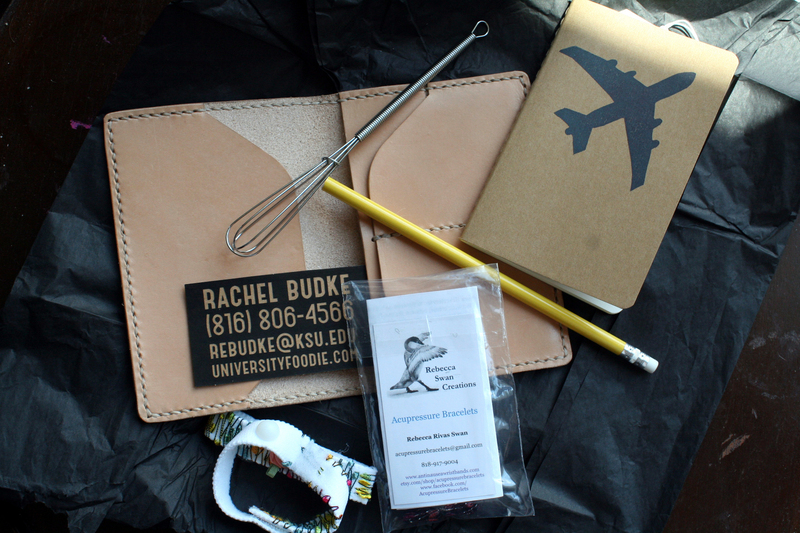 The prize package was a Travel Wallet from Reed Leather Goods, a Jetsetter Journal from 2 Bee Press, and Motion Sickness Anti-Nausea Bracelets from Rebecca Swan Creations. 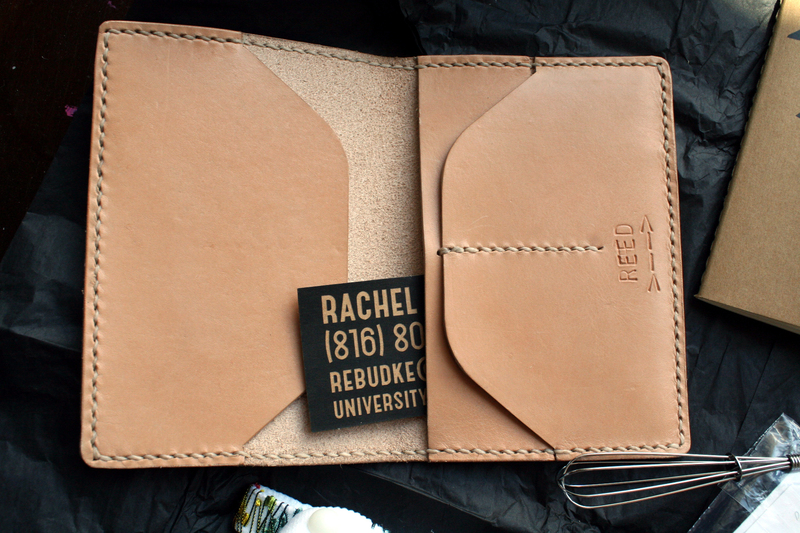 This is a generous prize and I was so happy to find Rachel on the internet and follow her! What she doesn’t know is JUST how Appropriate this prize IS for me! Thank you so much for this, Rachel. It was a pleasure to receive, open, and soon use these prizes. I love them. 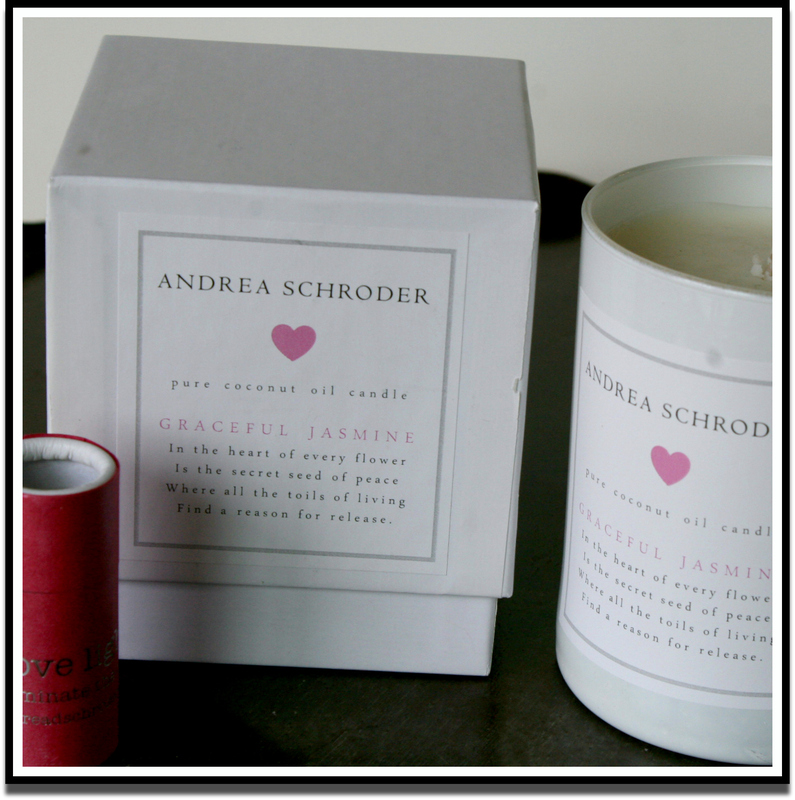 The contest is now closed….but you can always go over to Andrea Shroder’s store and order some of her wonderful candles! Thanks for playing along with me! 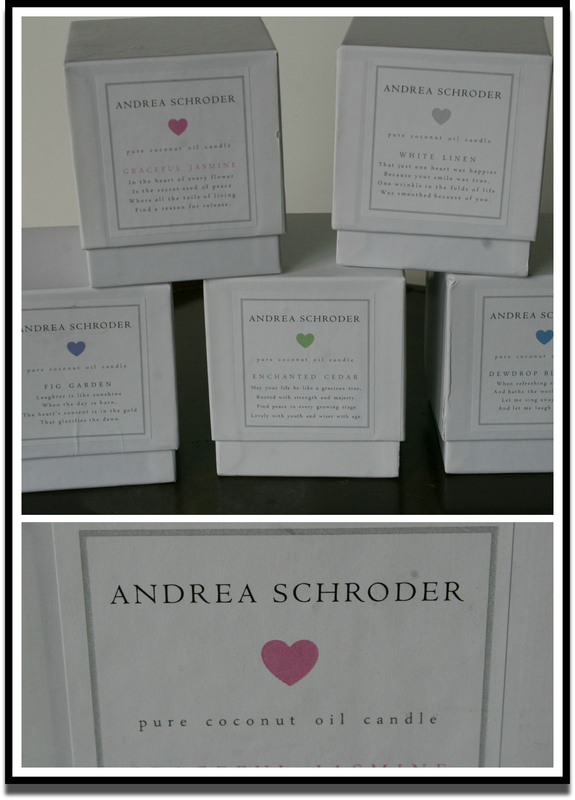 Andrea’s candles are made from pure coconut oil. They are beautiful, have a light but clean scent, and come in a fabulous box WITH a package of matches. I’ve ordered several times from her website and they arrive Lickety-Split! 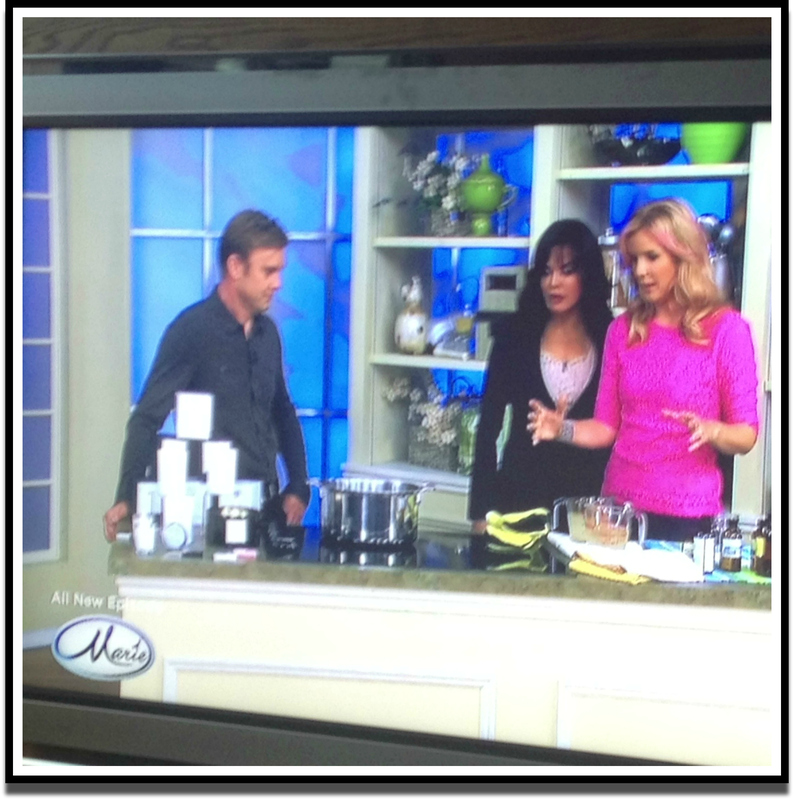 Her website also has lots of great projects she’s shared on the Home&Family show. I want to give away one of her candles! Leave a comment telling me your favorite candle scent. I’ll take comments until Saturday, July 13 at midnight and announce the winner on Sunday, July 14. 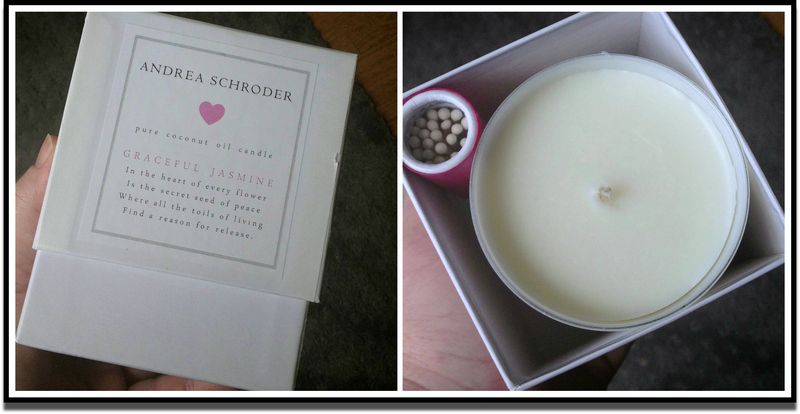 The winner will receive an Andrea Shroder Graceful Jasmine Candle. In THIS Gramma’s House, there are ALWAYS cookies in the cookie jar. Homemade or StoreBought, we’ve got cookies. 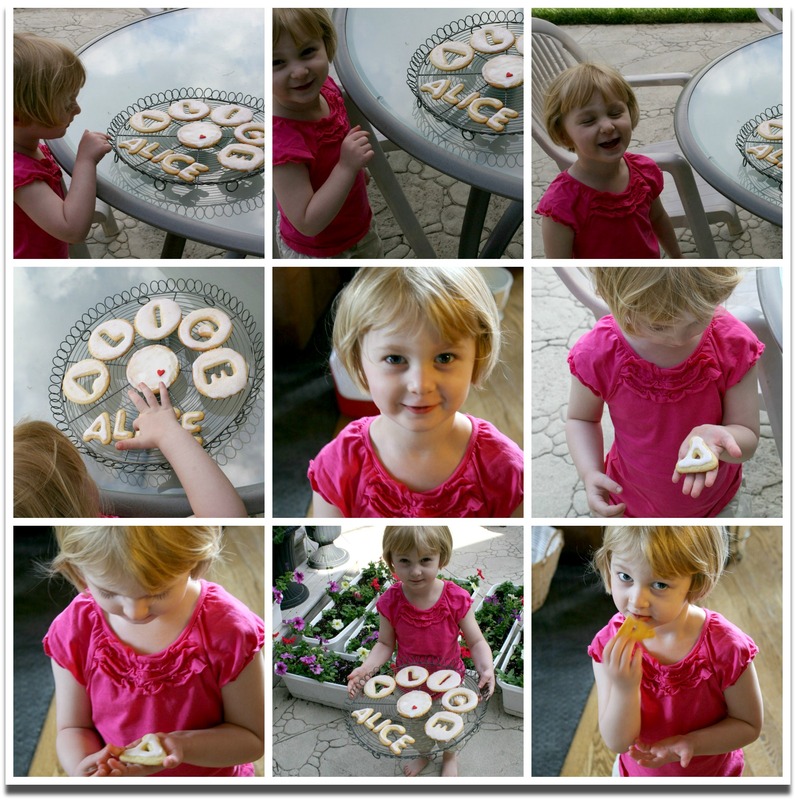 Lately, they are called “Alice Cookies” in honor of our granddaughter. I got an assignment for the EatWriteRetreat workshop I’m attending next week to make a batch of cookies with Monk Fruit In The Raw Sugar……and I knew it would be fun! 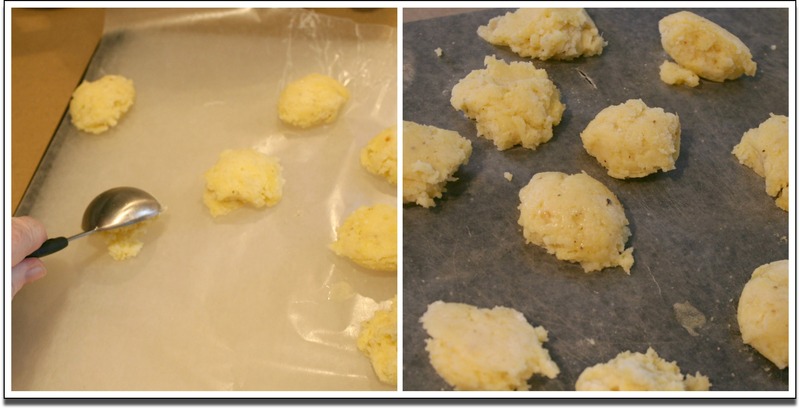 We were sent a recipe to make roll out sugar cookies…..and it mixed up in a breeze. The recipe used 1/2 regular sugar and 1/2 of the new sugar from In The Raw made from Monk Fruit. 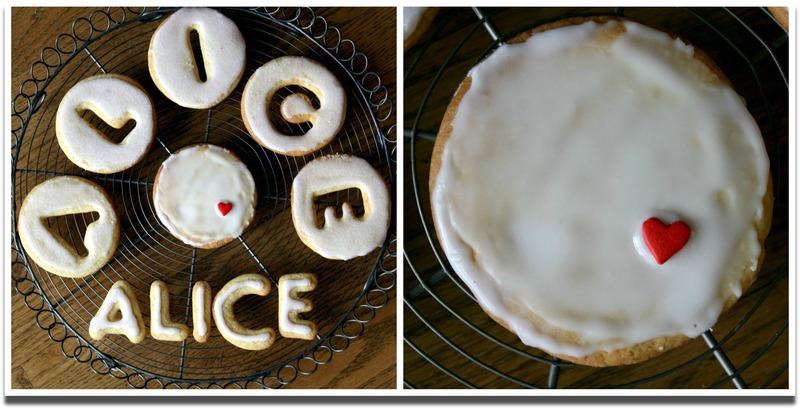 I’ve NEVER baked with anything but regular cane sugar, so I wondered how it would taste! Monk Fruit In The Raw Bakers Bag is an all-natural, zero calorie sugar alternative with a sweet,k clean taste that measures like sugar. Perfect for Grammas AND Alice’s! It mixed like “regular” cookies except there is one more step when you add the Monk Fruit In The Raw Sugar as a separate step. My super-duper picky daughter didn’t notice ANY difference when she snitched some of the dough. I put the dough in one plastic bag and let it rest in the refrigerator overnight. Rolling was easy peasy even right from the refrigerator. The dough was really nice and the cookies baked up perfectly. Next up, the frosting! I’ve been coloring and flavoring frostings with fruit juices lately. This one, I wanted to be light pink (Alice’s Favorite) so I made some strawberry “juice” out of some mashed and sugared strawberries. I used this “juice” as some of the liquid in my cookie frosting. We aren’t a “cookie frosting” family. We like a simple glaze of Powdered Sugar and a liquid…lemon juice, milk or 1/2 and 1/2, or even water! 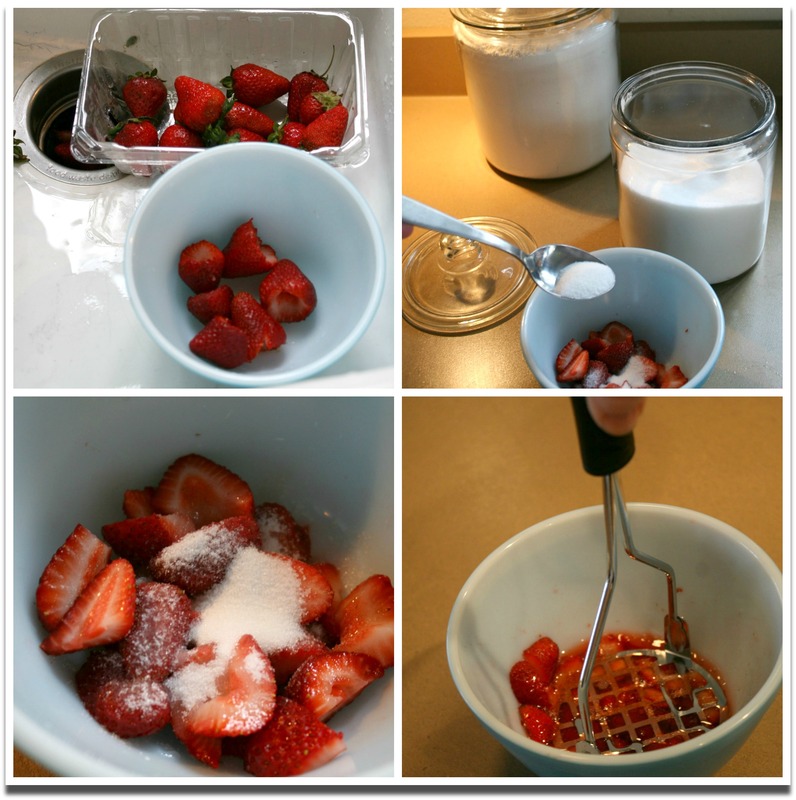 This one, used Strawberry “juice” and 1/2 and 1/2. I pour in the sugar, add a little liquid, and mix and add liquid until it is exactly how I want it to be. 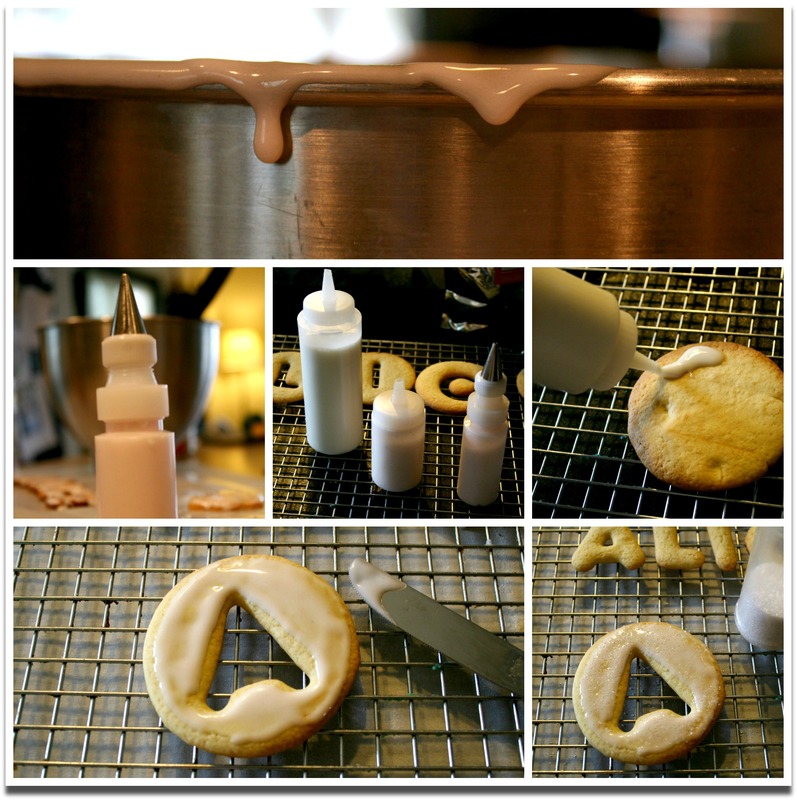 I pour my frosting into plastic decorator bottles add a tip to the lid if I want, and squeeze a small amount on the cookie and spread with a knife. 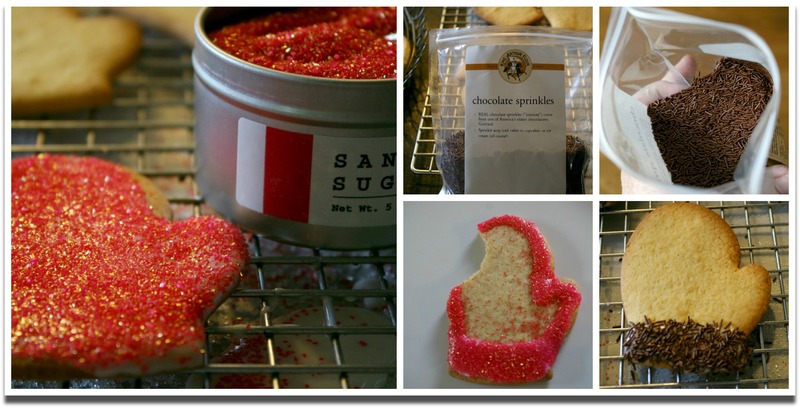 These, I added a sprinkling of Sanding Sugar for glitter and crunch. 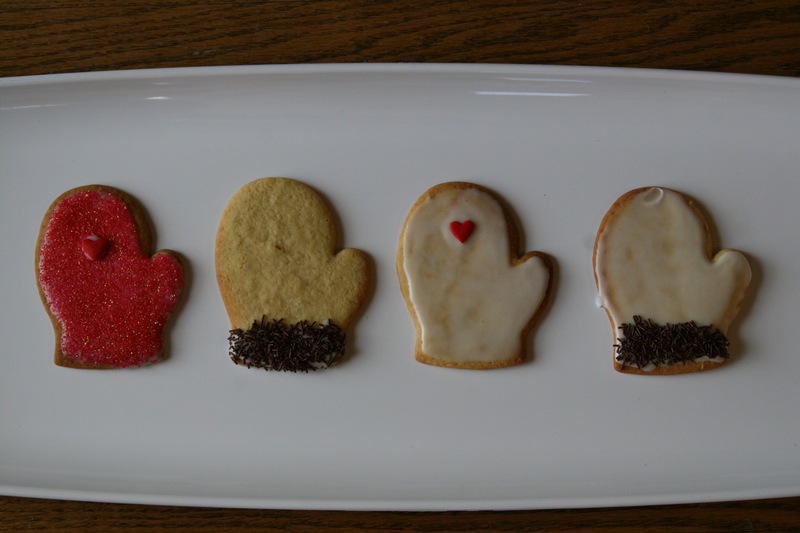 Yes, I made Red Mittens! I also used some delicious Chocolate sprinkles from King Arthur Flour. They are REAL chocolate and look and smell so good on a cookie. For THIS assignment, we had to make a 4-ish inch cookie and decorate it. 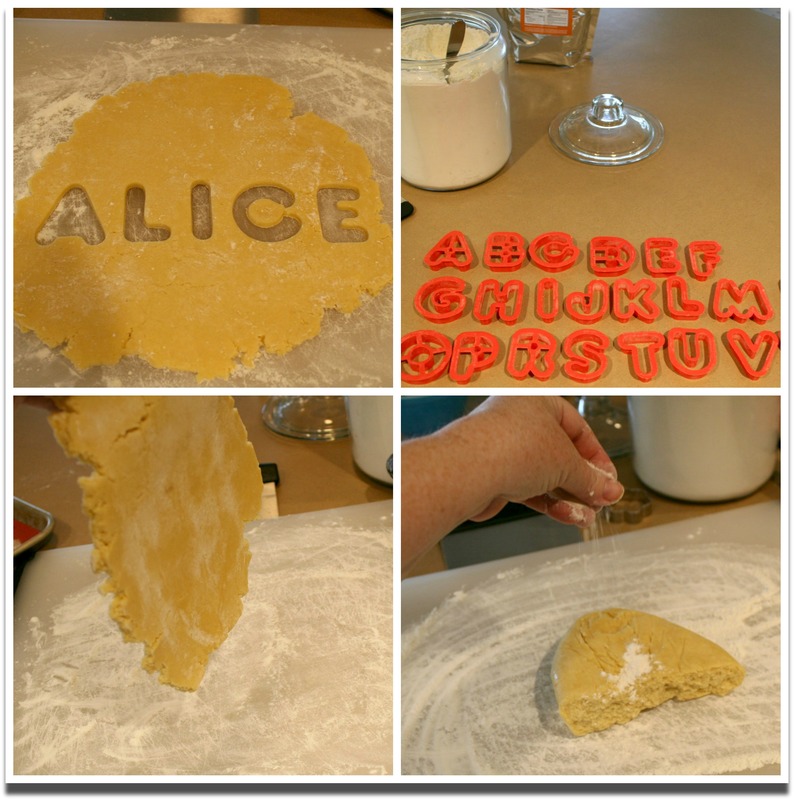 I chose to use a round cutter and then an alphabet cutter on the inside to spell A-L-I-C-E, a word Alice knows how to spell and read. While she napped, I decorated with the strawberry icing and the sanding sugar sprinkles. Then I waited for her to wake up! 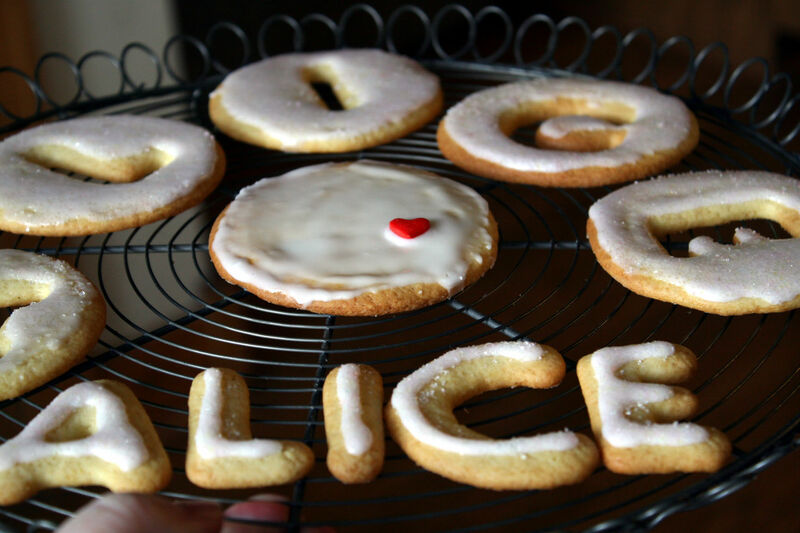 Alice Approved Cookies. These are keepers! 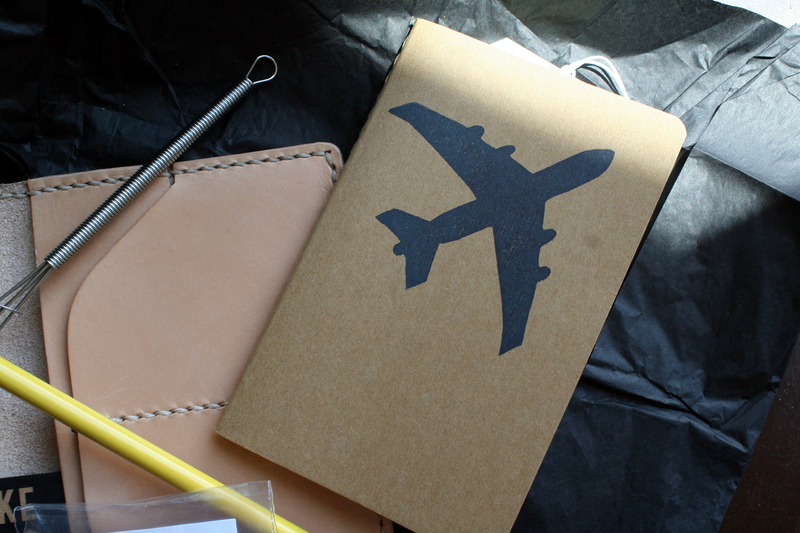 I am entering to win a prize at the Eat Write Retreat….I’ll let you know how I do! 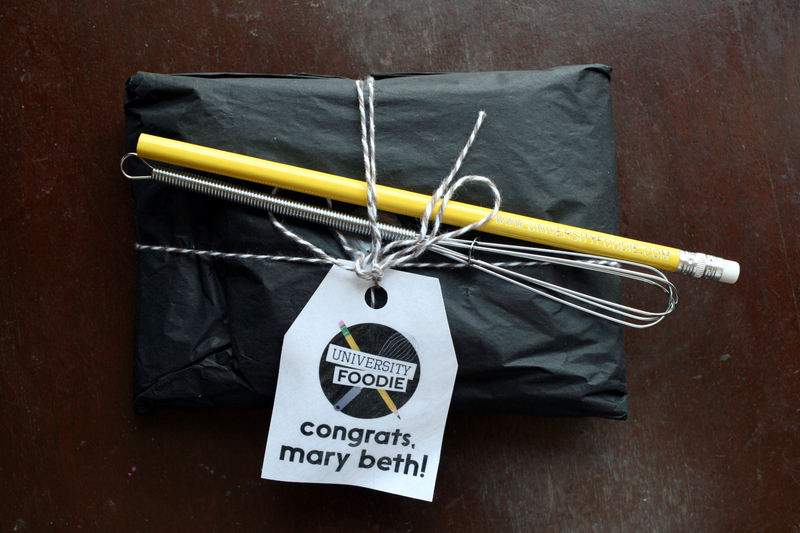 A few days ago, I received a Mystery Box from my friends at EatWriteRetreat, with instructions to make an Amazing Appetizer with the tools and ingredients. My Go-To snack for a party is a bag of chips and dip. Sometimes I make the dip, but I’ve never tried making Potato Chips. 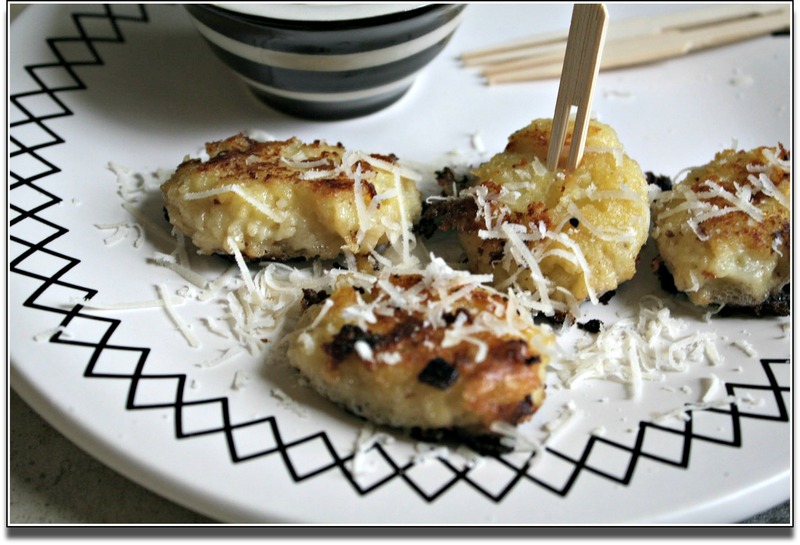 This recipe for Crusty Roasted Garlic Potato Gnocchi Bites will definitely blow the socks off a bag of chips! First step involved baking 3-4 Russet Potatoes until they are fluffy and dry. 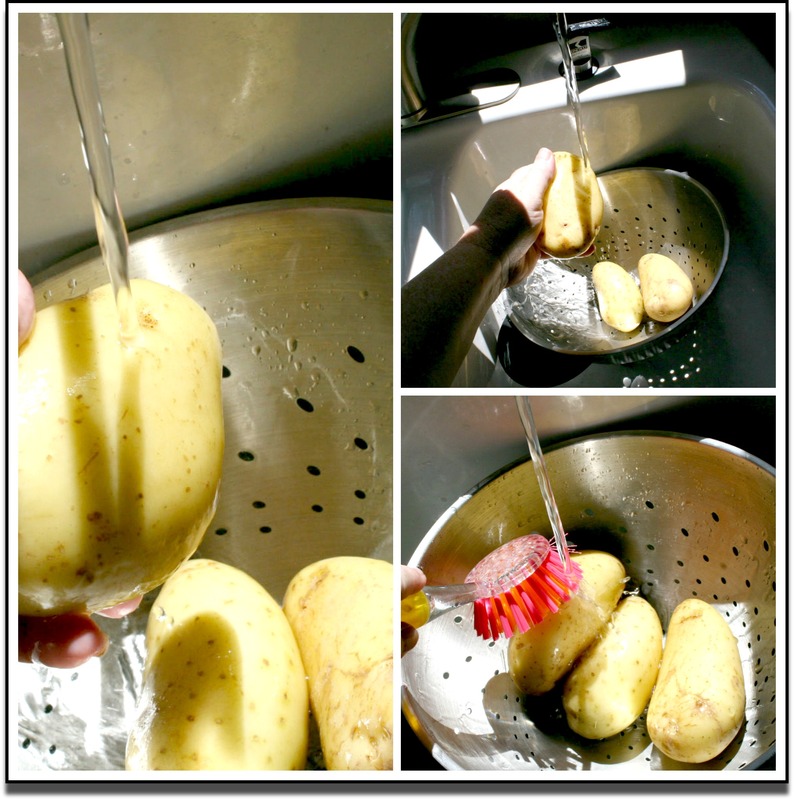 I always ALWAYS wash my fruits and vegetables before I use them. Do you? Poke the spuds with a fork and bake them for about an hour in the oven until they are soft to the touch. I even put them in the oven cold and turn it on. This recipe also has some roasted garlic, so cut the top off a head of garlic, drizzle oil and salt and wrap in foil to roast with the potatoes. I cooked both of these at 350*. The roasted garlic will start to make your house smell really wonderful! 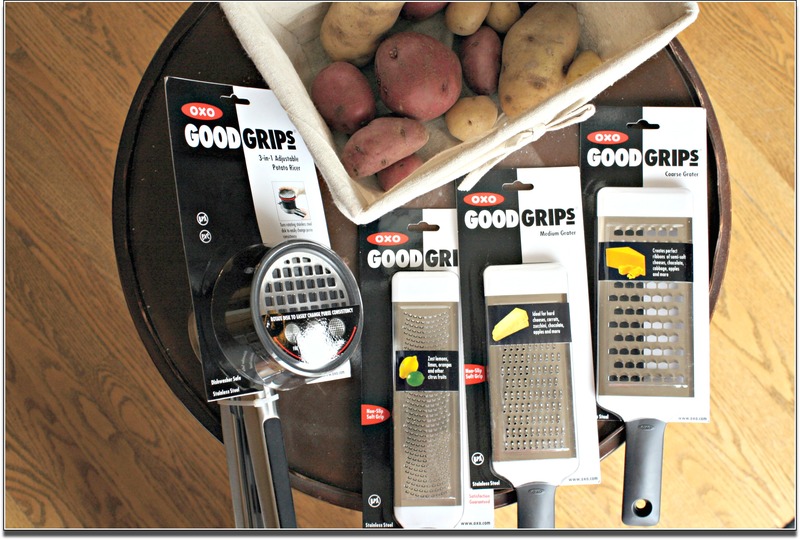 When done, take the potatoes out with your handy dandy OXO tongs or use potholders. Let them cool for just a few minutes and then cut in half. 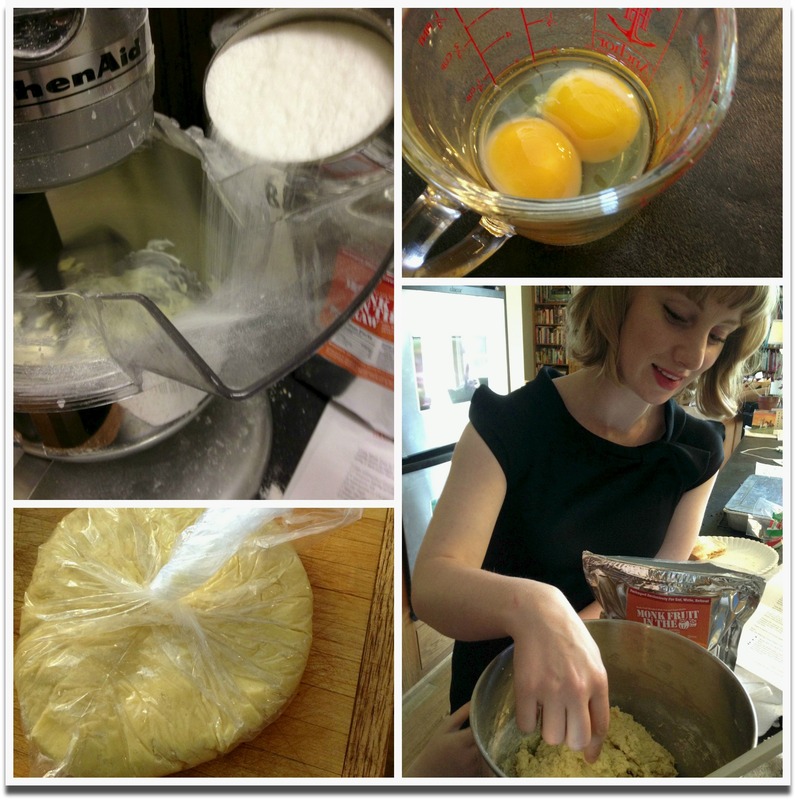 I used an OXO Potato Ricer device and it works great for making mashed potatoes to these gnocchi. 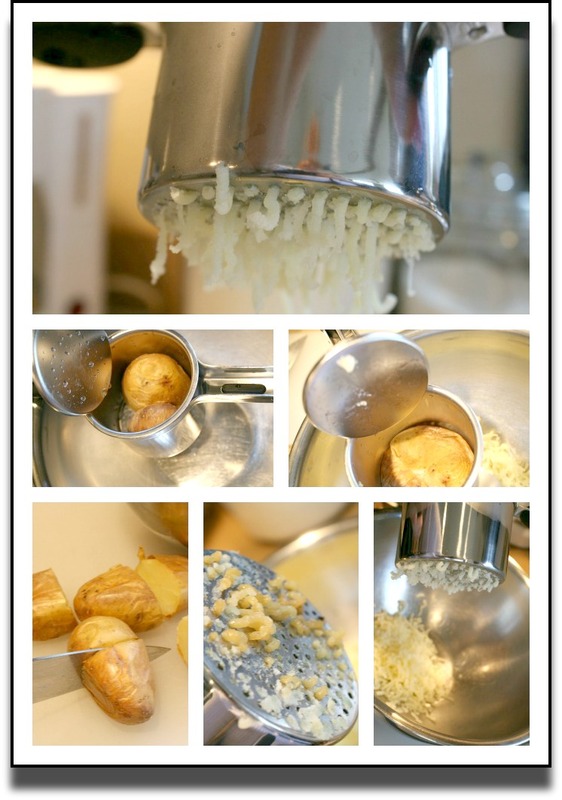 Most recipes say to peel the potatoes when using a Ricer, but I didn’t. I cut them in half and just put them flesh side down and squeezed! I was able to open the ricer and just remove the potato skin. Easy! Skipping that peeling step really saves time. It is nice to use a cooking tool to your advantage. You can put the fluffy dry riced potato on a cutting board or counter or in a bowl. I used a bowl. Oh! That OXO Ricer? You can totally put it in the dishwasher! I KNOW! I wasn’t sure you could, but you CAN! Squeeze the roasted garlic out of the “paper” and add the soft, sticky roasted garlic to the bowl of potatoes. I even tried using the ricer to get the last drop out of the garlic head! 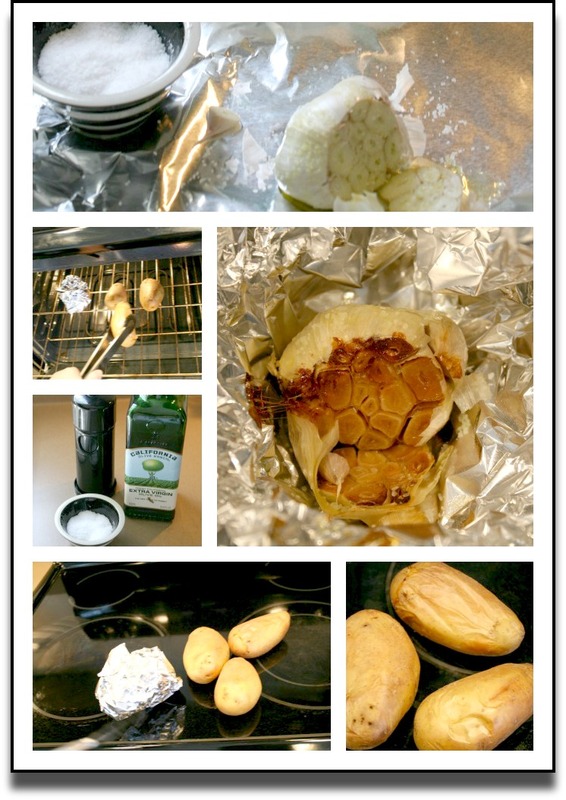 You should have about 2 cups of loosely packed potato. 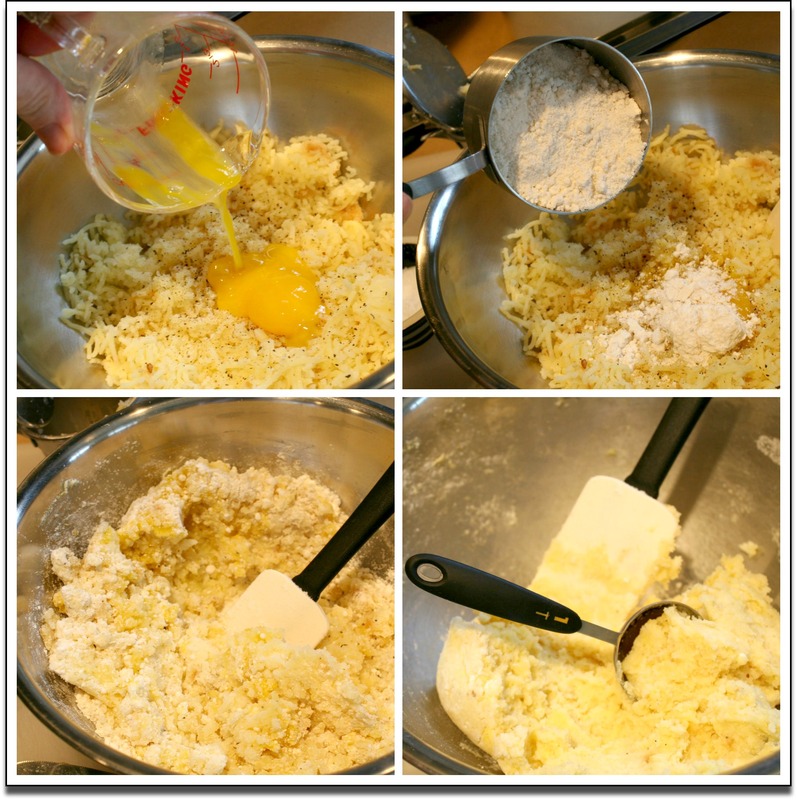 Add 2 egg yolks and about a 1/2 to 3/4 cup of Bisquick or Jiffy Mix, some salt and pepper. 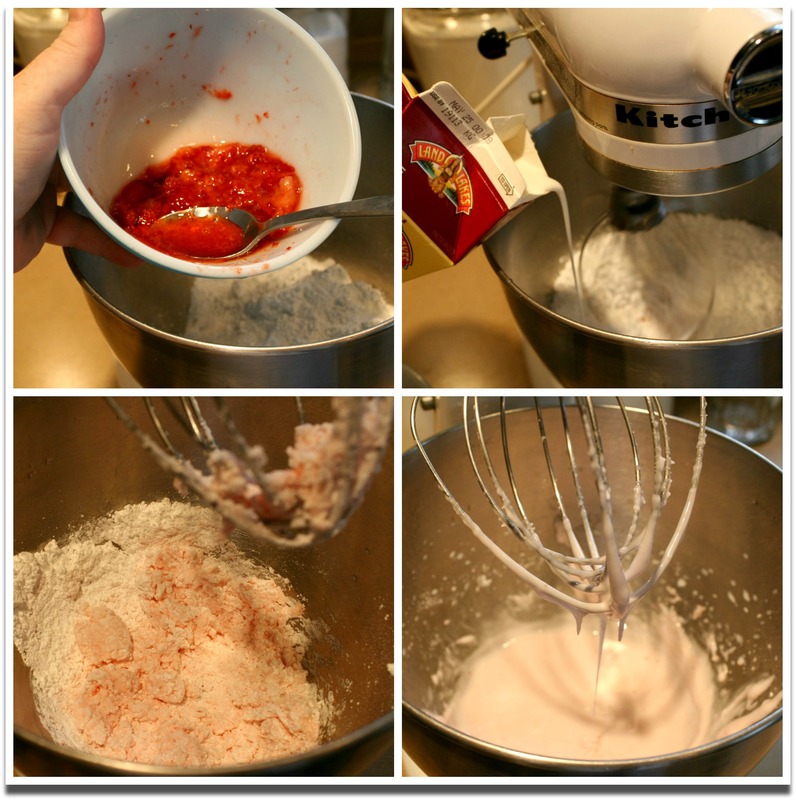 Carefully mix using your hands or an OXO spatula until combined. Instead of rolling these into a long rope and cutting off a section, I used an OXO tablespoon and just scooped the dough out of the bowl and plonked it onto a piece of waxed paper. It only takes a few minutes. I sprayed the spoon with some oil to facilitate the “plop”. In the meantime, saute about 1/2 an onion in a pan with some Olive Oil. 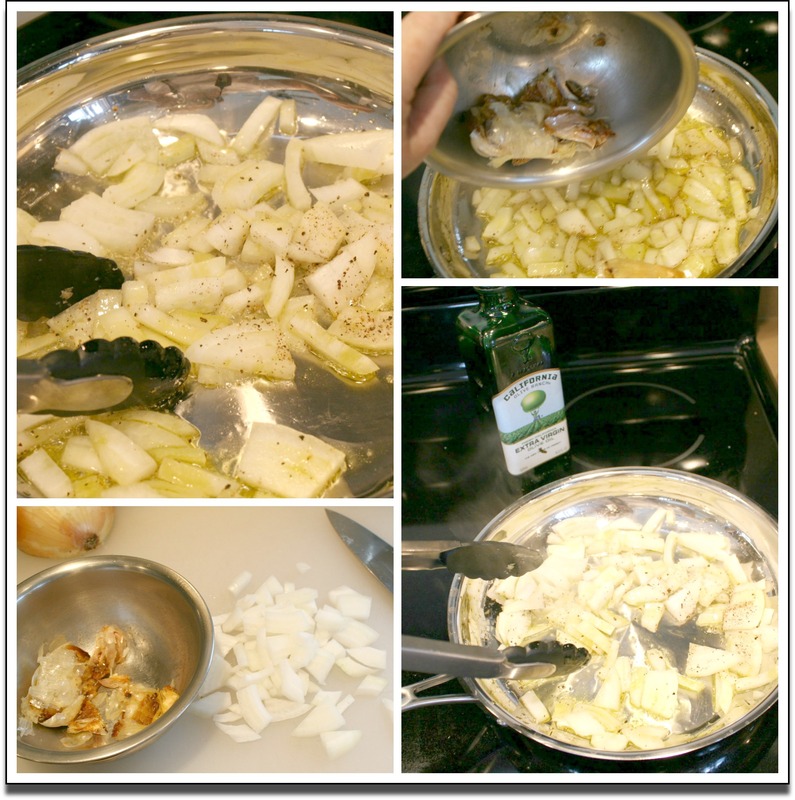 We are going to use the onions for dip and the flavored oil to saute the Gnocchi Bites to make them crispy. I even added the squeezed garlic head. The papery part got a bit burned, so do this at your own risk. Next time, I’ll take off more of the paper. Remove the onion and set aside in a small bowl. Add 2 T. of butter to the pan and let it melt. 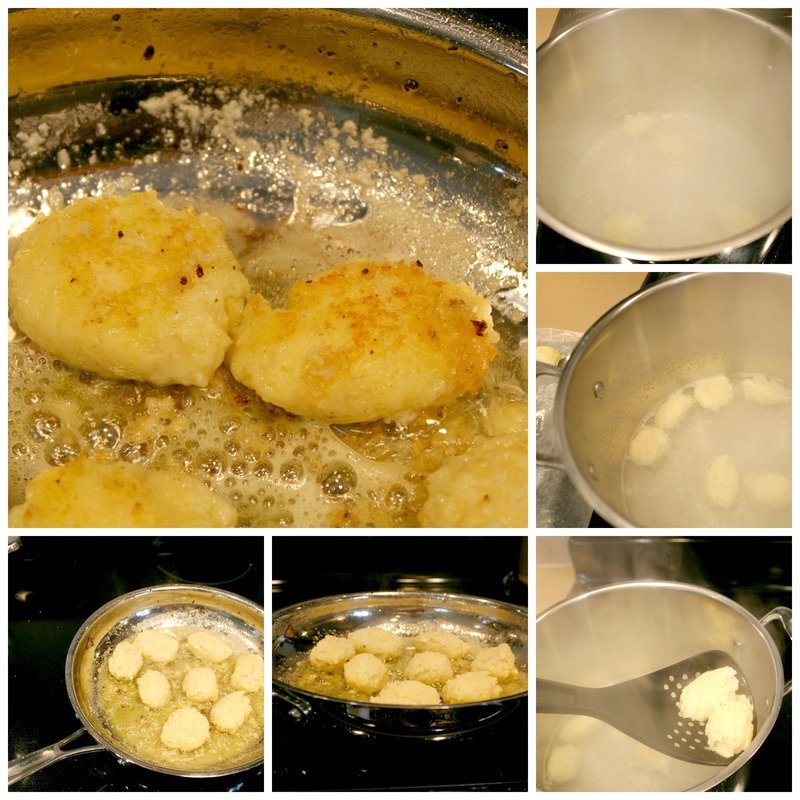 Bring several cups of water and salt to a boil in a large pot to cook the gnocchi for a few minutes. Carefully add the potato puffs and let it gently boil until it comes to the surface. Take out and put into the pan of flavored oil and butter and let it get browned and crispy. Keep it moving. I doctored up some dip while the gnocchi’s were crisping up. 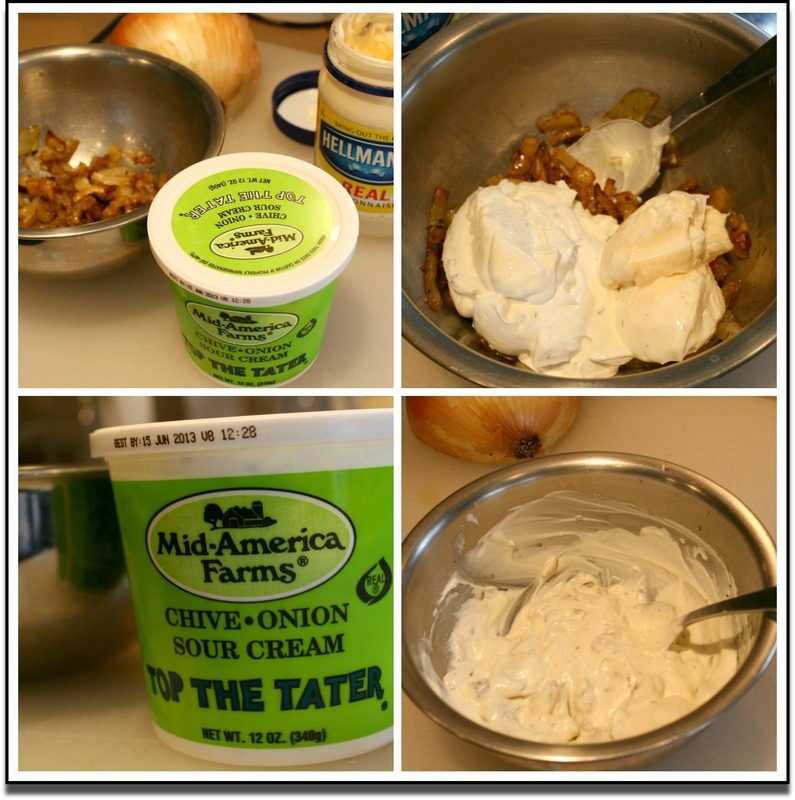 I just used some good sour cream dip, a bit of good mayonnaise and the onions. Stir it up and refrigerate. My grandmother was a “doctor-er” and I find my self doing that, too. 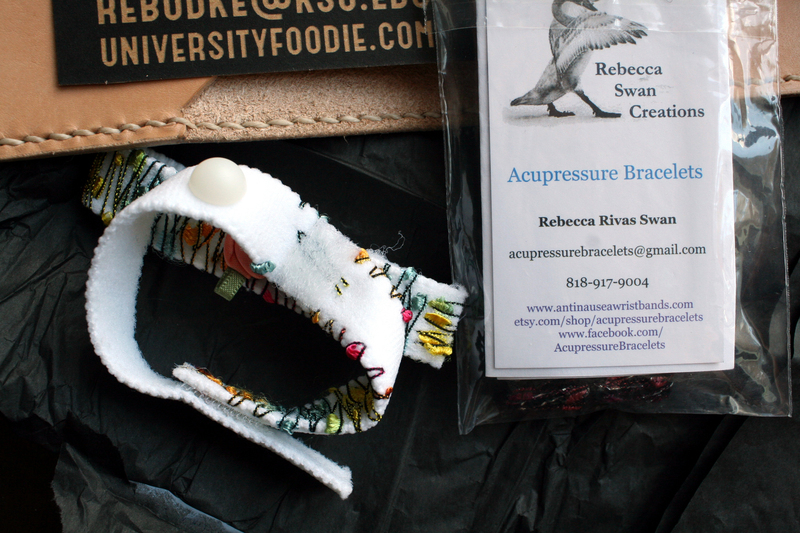 Make a purchased item your own by adding some more flavor! These are really good. They really don’t taste like traditional Potato Gnocchi but the resemblance is there. A shaving of Parmesan cheese shredded over the top will slightly melt and make it even crispier. Do yourself a favor. Get some REAL cheese and a nice grater and use this instead of the bagged stuff. It tastes SO much better! I’m attending a Blog Conference in a week called EatWriteRetreat. 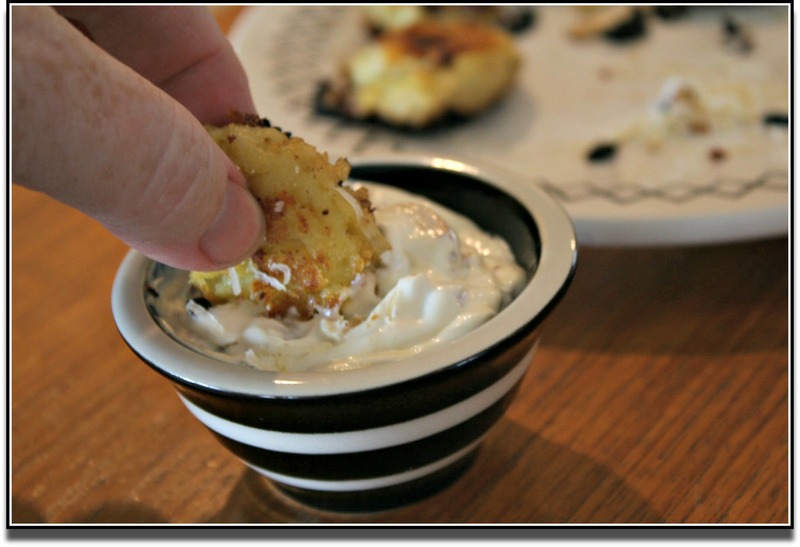 One contest is to create an Amazing Appetizer from a mystery ingredient. 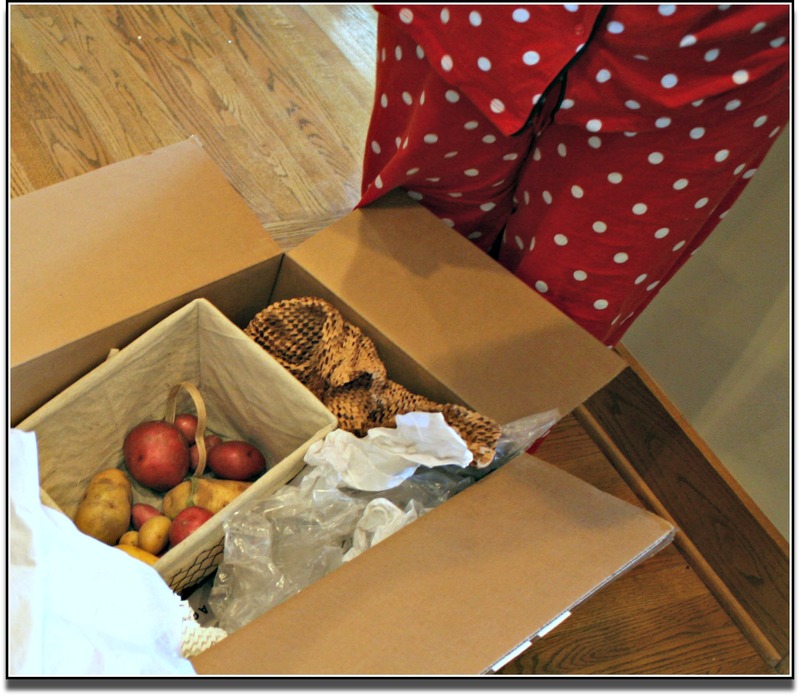 I got Potatoes! I LOVE Potatoes! I loved a dish at a local restaurant that was Potato Gnocchi in a luxurious cream sauce. I found out they used Biscuit Mix in their Gnocchi, so I thought this would be a great time to try it! 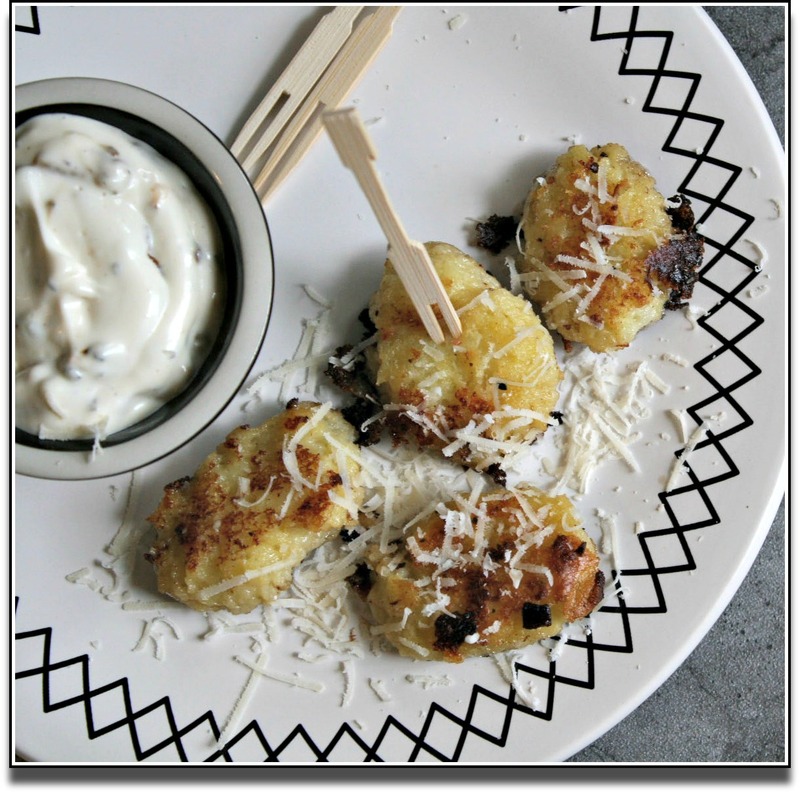 These Crunchy Roasted Garlic Potato Gnocchi Bites are a FABulous appetizer! They are addictive, filling and unique. They take a little time to make, but your family and guests will say “this is AMAZING!”. And….that is why we cook!